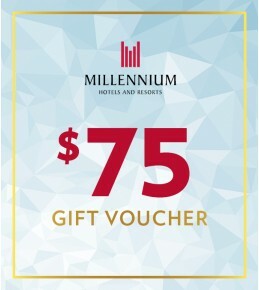 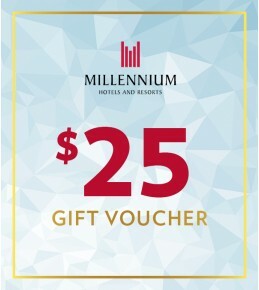 Your Gift Voucher:This voucher entitles the bearer to:One night Superior Room or Superior Lakeview Room accommodation including full cooked buffet breakfast for 2 adults and 2 children (11 years and under) One complimentary 30-minute relaxing massage at The Spa per room 20% off Velocity .. 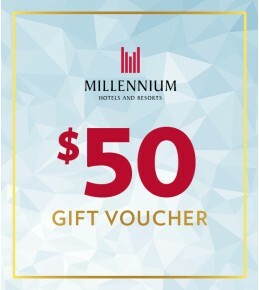 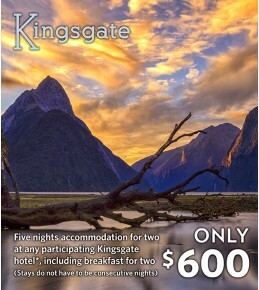 Your Gift Voucher:This voucher entitles the bearer to:Two nights Superior Room or Superior Lakeview Room accommodation including full cooked buffet breakfast for 2 adults and 2 children (11 years and under) One complimentary 30-minute relaxing massage at The Spa per room 20% off OGO 20%.. 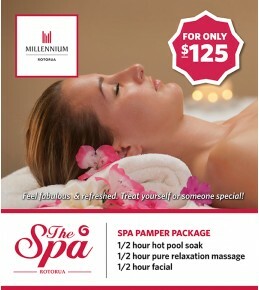 Your Gift VoucherTreat yourself or someone special to a pamper package at The Spa at Millennium Hotel Rotorua.Package details: 1/2 hour hot pool soak 1/2 hour relaxation massage 1/2 hour facial .. 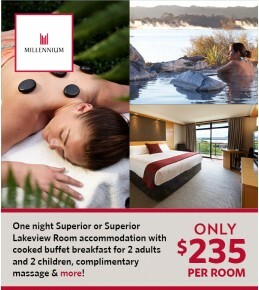 Your Gift VoucherTreat two people to a pamper package at The Spa at Millennium Hotel Rotorua.Package details: 1/2 hour hot pool soak 1/2 hour relaxation massage 1/2 hour facial .. 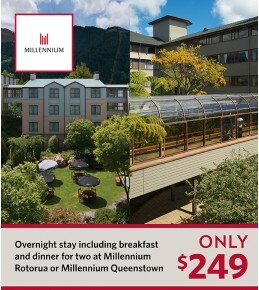 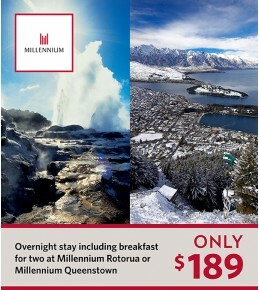 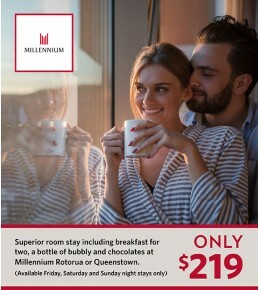 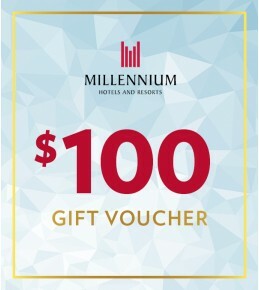 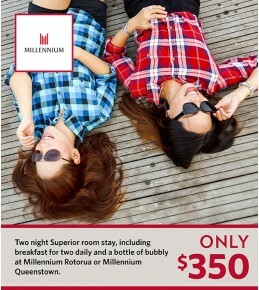 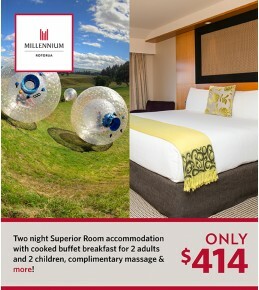 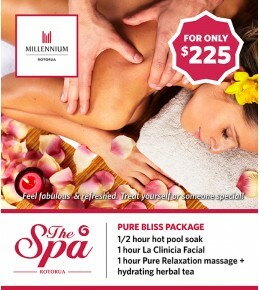 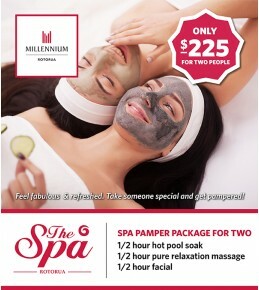 Your Gift VoucherTreat yourself or a loved one to a pamper package at The Spa at Millennium Hotel Rotorua.Package details: 1/2 hour hot soak1 hour La Clinicia Anti-Ageing Facial 1 hour pure relaxation massageAllow 2.5 - 3 hours.&n..